Arsenal keeper Lukasz Fabianski has signed a new long-term contract with the Premier League club. The 24-year-old made 18 first-team appearances for the Gunners last season establishing himself as Arsenal's number two behind Manuel Almunia. 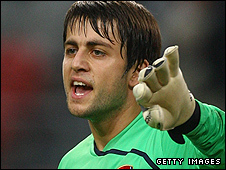 Fabianski joined Arsenal in 2007 and has also broken into Poland's senior team for the 2010 World Cup qualifiers. "It's a big motivation for me to keep working hard and it shows that the club believe in me," said Fabianski. "I'll be doing everything I can to repay that belief by helping Arsenal to win trophies in the coming years." Who should Arsenal sign next season? Manager Arsene Wenger was delighted that the club had managed to secure the long-term services of Fabianski. He said: "I rate Lukasz highly and I am very pleased that he has committed his future to the club. "I believe he is a top competitor, he's intelligent and reads the game very well and has all the ingredients to be successful in his position."